Please note that this organism is for archival use only. Please see the current Ostreococcus tauri RCC4221 v3.0 site for the latest data and information. Ostreococcus belongs to the Prasinophyceae, an early-diverging class within the green plant lineage, and is reported as a globally abundant, single-celled alga thriving in the upper (illuminated) water column of the oceans. The most striking feature of O. tauri and related species is their minimal cellular organization: a naked, nearly 1-micron cell, lacking flagella, with a single chloroplast and mitochondrion. Three different ecotypes or potential species have been defined, based on their adaptation to light intensity. One (O. lucimarinus) is adapted to high light intensities and corresponds to surface-isolated strains. The second (RCC141) has been defined as low-light and includes strains from deeper in the water column. The third (O.tauri) corresponds to strains isolated from a coastal lagoon and can be considered light-polyvalent. Comparative analysis of Ostreococcus sp will help to understand niche differentiation in unicellular eukaryotes and evolution of genome size in eukaryotes. 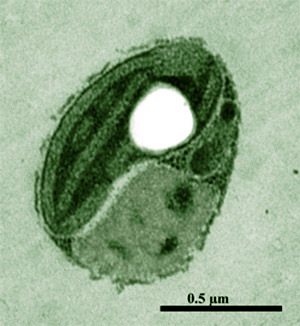 Publication: (2007) The tiny eukaryote Ostreococcus provides genomic insights into the paradox of plankton speciation. Proc Natl Acad Sci U S A., 104, 7705-7710.